Indian weddings are some of the most challenging, yet rewarding, assignments a professional wedding photographer can undertake. The diversity one experiences as an Indian wedding photographer comes from the fact that there are countless cultures within the domain. I have photographed one day Indian weddings that had 100 guests at a single location. I have also photographed wedding celebrations that lasted three days and hosted more than 600 guests. One of Long Island’s premier venues for Indian weddings is The Hyatt Regency Long Island at The Wind Watch Golf Club in Hauppauge, New York. I am proud to be one of The Hyatt Regency’s recommended photographers. Most of my assignments start with the application of the Henna tattoos...the Mendhi. Henna is used to decorate the hands and feet of the bride...usually the night before her wedding in the company of female friends and family members. 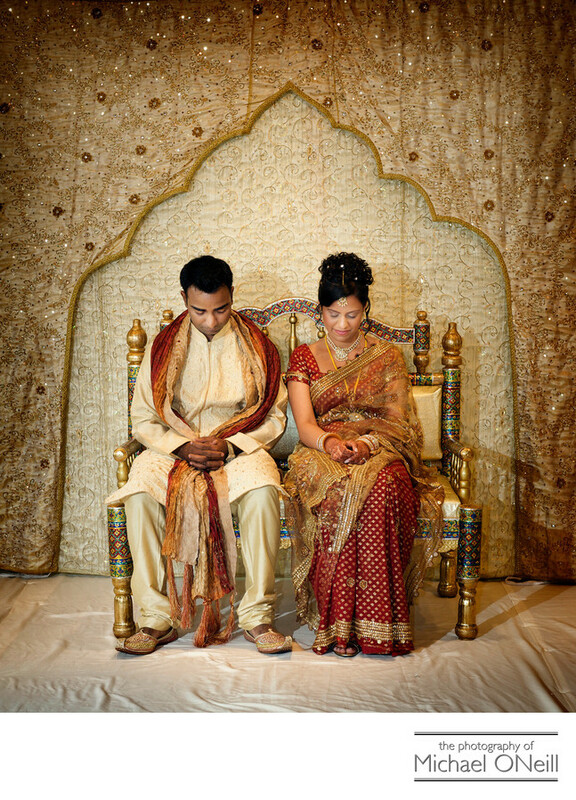 The next day the traditional Indian wedding ceremony takes place which includes the Saptapadi...the Indian equivalent of the exchange of vows in Western cultures. At the end of the ceremony you witness the Milne where the bride and groom’s family celebrate the union of the two clans. Then the wedding celebration commences with culturally-specific music, dancing and cuisine. This picture was taken at an Indian wedding catered at a waterfront New York City (NYC) location. The bride and groom, dressed in their traditional Indian wedding garments looked beautiful against the luxurious embroidered backdrop.